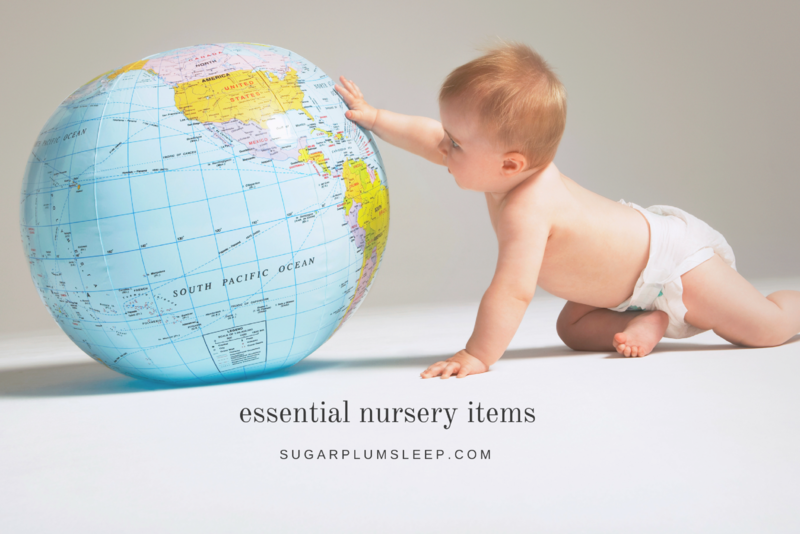 Sleep Training Expert Shares The 5 Essential Nursery Items for a Good Night's Sleep | The Sugar Plum Sleep Co. When I was pregnant I remember spending hours scouring Pinterest for nursery design inspo. I loved selecting items to create a sweet sleep space, but I probably should have given a little more thought to how to make my son’s bedroom safe, calm and quiet (not just pretty). Fast forward to two kids later and five years as a sleep training expert and I now have a much better handle on the situation. I’ve drilled it down to five essential nursery items. My five nursery essentials are all about setting the foundation for great sleep skills from the start. I’m not going to go through safety tips with you, but I do want to remind you that babies move through different stages very quickly! Your little one might not be running around in their cribs just yet, but once mobility starts, it’s important to be on the look out for any hazards. I often come into a home and see the video monitor placed on the corner of the crib instead of being securely mounted. Other hazards include cords from blinds hanging close by a crib or décor item on the wall next to the crib. When a baby isn’t moving much during sleep, these aren’t obvious safety concerns but even a quickly learned skill like rolling, sitting standing, and climbing, could bring these hazards within reach. in part by light and darkness. Light cues trigger chemical changes, including the release of the hormones melatonin and coritsol. Melatonin is released as the light in our environment decreases. It’s responsible for helping the body prepare for and maintain a state of sleep. Cortisol helps to prepare the body to become alert and active and is released when we are exposed to light. You don’t need to spend a lot of money. Use room darkening shades, lined drapes, Bristol board, or a combination of window coverings to create a darker sleep space. Check out my own DIY efforts. If your child struggles with naps, this might be the reason why. I’m a huge proponent of using a fan in the bedroom. A fan can help minimize environmental disturbances like traffic and noises from other family members inside the home. You can also use a traditional noise machine. Keep in mind that many commercially available sound machines are capable of producing noise outputs that exceed the suggested noise limit of 50 A-weight decibels (dB) for hospital nurseries. Exposure to sound machines with high noise output may put infants at risk of developing noise-induced hearing loss or abnormal development of the auditory system. If you are using a sound machine in your home, take some time to evaluate whether the noise level and duration of use is appropriate for your baby’s and your family’s needs. A good quality monitor will let you see and hear what’s going on in the house. This helps you feel more confident about giving your child time to settle while trying to fall asleep. It also lets you spend time in your home’s outdoor spaces while your child naps. This is particularly useful if and when you have a second child. Once your baby is demonstrating even an interest in rolling, the swaddle could become a safety issue. Swaddles also prevent babies from using their hands to help deal with teething discomfort and to fall asleep. Use an appropriately sized sleep sac to keep them comfortable. Here’s the best part about sleep sacks: If you get your baby used to it now, there’s a good chance that your baby will continue to use it until they are older. When they reach an age where they start to make attempts to climb out of their crib, a sleep sack can limit their ability to do so.